Now I know this isn’t the most healthy of posts or abundant in photos, still no luck on the camera front sadly. But I had success this week with deep-frying. Normally when I fry anything in either batter or crumbs, it falls off and I end up with “naked” chicken and a lot of random bits of batter clogging up my oil. Crack the egg into a mixing bowl and beat, add the seasoning and then enough flour to have the right amount of batter for you. Add baking powder and sugar mix, slowly add water till the mixture thins down a little, try to keep the batter as smooth as possible. Heat the oil or ghee on a medium heat, use a small pan and fry in batches so you use less fat. Dip the chosen object in batter making sure it is fully coated and then carefully place in the batter. cook for approximately 2 minutes on either side, then fish out and place on kitchen roll. I served this with a sweet and sour sauce with noodles, it would go equally well with most oriental sauces or as a replacement to shop bought chicken dippers. Though it crisped well it was a little heavy so possibly substitute the cold water for beer, to get a lighter batter, if you are going to have them without sauce i would suggest adding some garlic, ginger or chilli to the batter mix to give it some extra flavour. yeah it sounds weird i know, but we’d just done an asda online shop, and I had a lot of lovely thin streaky bacon, the best kind of bacon in my opinion. I was craving sugar and flicking through one of the many food blogs i have recently bookmarked, when i found a recipe for bacon and maple ice cream http://www.deliciousdays.com/archives/2010/06/29/bacon-ice-cream-with-a-hint-of-maple-weird-but-in-a-good-way/ and though I have an ice cream maker I didn’t quite feel up for this quite yet. Though it did make me think of candied bacon, I think the Wednesday chef has a recipe for bacon fudge on her blog but I’m not sure. Anyway the long and short of this rambling post is that I lay down 5 strips of bacon and coated them liberally in a mix of brown sugar and cinnamon, and baked them for about 5-10 minutes, turning them and adding more of the spiced sugar. It was defiantly an interesting flavour, the cinnamon cutting the smoked edge of the bacon. I’d recommend trying it. Freshers flu Strikes and I’m not even a fresher!! So I have been struck down with freshers flu! Nooo, seriously every year I get it, I don’t think it is fair. I mean I’m not even a fresher I’m a third year, but sadly I’m not immune- there is something about coming back to university that breeds germs. All those people from different places, coming together getting packed in small bars and lecture theaters, it’s bound to happen. And I’m guessing the cold weather up here doesn’t help either. I Can’t really remember freshers flu last year, so it must have been pretty mild, which is something, saying last year was the swine flu scare. I guess working in summer camps means you’re pretty much immune to anything by the end of it. But first year when I was actually a fresher, that was spectacular, I fell asleep constantly! I remember sitting down in a lecture and suddenly realising there was no way I was going to concentrate, sadly the lecturer arrived before I had a chance to leave. The rest of that weekend was spent sleeping and drinking JD from a hipflask. Not the best idea but awesome all the same. So food, that is what this blog is supposed to be about isn’t it. Well this week I haven’t eaten that many interesting meals hence the lack of posts, sorry guys. Today I decided to fight the cold with fire and spice, in soup form of course because my throat is sore. I’ve been told spicy food is good for a cold and I have to agree, it definitely perks you up. Chop the onion into thin slices and fry until it starts to soften, then add the ginger and the chilli. Be generous – you want the flavour to be intense to cut through the cold. As I was using crushed ginger paste and crushed chilli paste which are both quite potent I used a teaspoon of each. Finely chop the parsnips and add to the onions, fry for a short while then add the stock. Bring this to boil then leave simmering for about 20 mins, until everything is nice and soft. 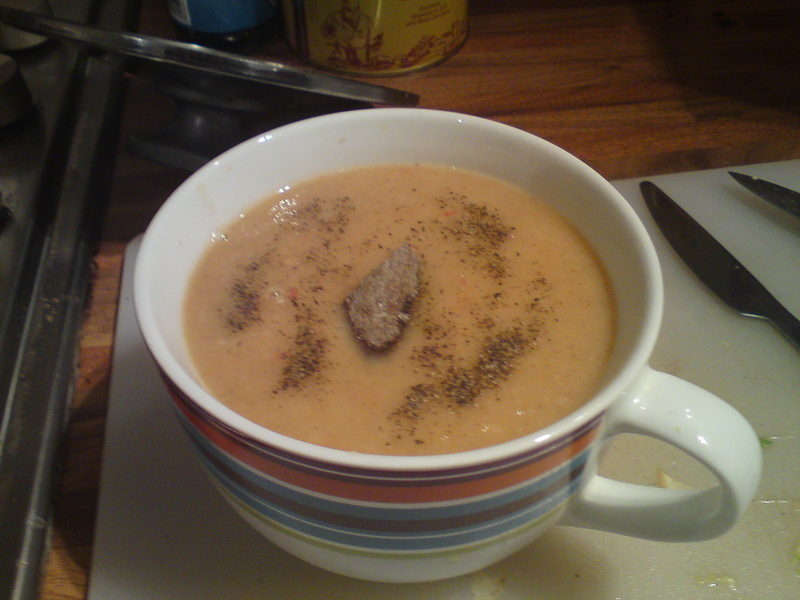 This is one of those soups I like to blend, so once the veg has softened I allow it to cool a little then blend with a hand blender. Add a generous amount of cinnamon approx 2 tsp, and stir in, season to taste and consume.